Dining hall workers at Harvard University started their strike earlier this month. If you’ve strolled through Harvard Square in the past two weeks, you’ve probably heard the chants and the drums. 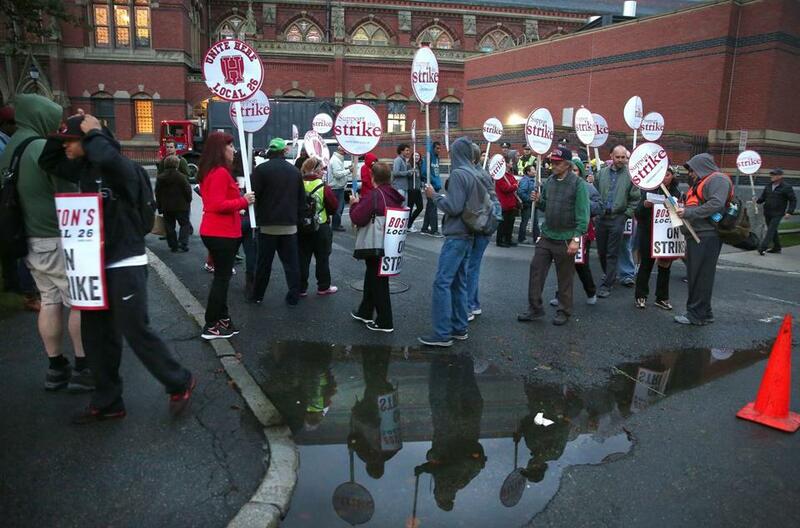 Harvard’s 750 dining hall workers are on strike, and they’re picketing all around campus. This is pretty uncommon for Harvard. The strike is the first at the university since 1983, and that one only lasted one day. So what’s the strife all about? We’ve crafted a quick cheat sheet to answer all your questions and get you up to date on where the two sides stand. The employees walked off the job on Oct. 5, after more than four months of unsuccessful contract negotiations. They hope to secure annual wages of at least $35,000. They argue that Harvard can afford to pay that much because the university leads the education world with an endowment of more than $35 billion. They’re also lobbying Harvard to keep their health insurance policies at the current level. They say a new policy Harvard has proposed would prove too costly for workers. What do the workers make now? At an average wage of nearly $22, the workers’ hourly pay is higher than their counterparts at other regional college dining halls, and well above typical pay for non-academic food service workers. Unlike dining hall employees at other colleges, Lang said, most of the Harvard workers are unable to claim unemployment during the between-semester periods. That’s because they are employed directly by Harvard and not through a third-party food service companies. Harvard administrators have been quick to point out that the workers’ hourly wages are higher than those at other schools’ dining halls, including locations represented by Local 26. Additionally, accounting for overtime, more than two-thirds of the workers already make more than $35,000 a year, Harvard says. In negotiations, the school has offered summer pay to employees in the form of weekly stipends of $150 to $250, based on seniority, even if they don’t work any shifts. The union has said summer stipends could be a workable solution to the issue, but that the proposed weekly pay is too low. In a counteroffer, the union suggested weekly summer pay of $450. Harvard also defends its health care proposal, saying insurance costs are going up in every sector and that the school’s largest union agreed to the same policy earlier this year. The school, citing the Bureau of Labor Statistics, says that striking workers pay less for health care than other food service workers. School administrators published their arguments in a letter to students and faculty last Tuesday, after an unsuccessful weekend of negotiations. That didn’t go over so well with the union, which accused the school of attempting to “vilify” the workers. Each side has accused the other of not taking the discussions seriously enough. The parties went a week between meetings before a meeting with mediators went into the night on Monday. Tiffany Ten Eyck, a union spokeswoman, declined to provide any details from the meeting, but said discussions have begun again. The union says workers will stay off the job indefinitely. They’re being paid $200 per week through a strike fund, and the union has also launched an online fundraiser to support them. What are things like on campus? Workers have picketed daily outside Harvard’s dining halls, with larger-scale rallies elsewhere on campus. Several student groups have offered their support to the workers. Some medical students published an analysis suggesting the school’s health care proposal would increase the workers’ costs. And four law school groups have gone against the administration’s wishes by voting to spend school money to help feed the workers, the Harvard Crimson reported. Support has also come from outside the student body. Senator Elizabeth Warren and actor Ben Stiller are among the high-profile faces who’ve made picket line appearances. As the strike has dragged on, the union has adjusted tactics. A sit-in on the streets of Harvard Square late last week resulted in the arrest of nine workers and two union officials. Are the dining halls operating? Harvard has closed some of the halls. The still-open halls are being staffed by managers, non-union workers, and temporary employees. Itzel Vasquez-Rodriguez, a Harvard senior and member of the school’s Student Labor Action Movement, which supports the striking workers, said the dining halls are noticeably emptier. Plates and silverware have been replaced with plastic plates and cutlery, she said. Tania deLuzuriaga, a Harvard spokeswoman, said the school’s environmental health and safety office found no violations at the dining halls in an inspection last week.